Not to be confused with Ulceby, East Lindsey. 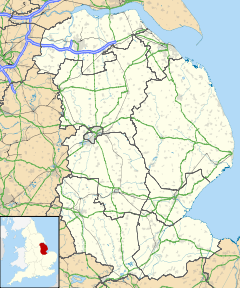 Ulceby is a village, civil parish and post town in North Lincolnshire, England. It is situated 0.5 miles (0.8 km) north from the A180 road, 10 miles (16 km) north-west from Grimsby and 14 miles (23 km) east from Scunthorpe. Ulceby is a rural village surrounded by fields, farms and the nearby villages of Habrough, Wootton and Croxton. At the 2001 census the village had a population of 1,500 in 631 households, and at the 2011 census the village had grown to 1,711. Ulceby Primitive Methodist Chapel was converted after being privately purchased in 2011. It is now known as "The Chapel" but the inscription "Primitive Methodist Chapel" is still visible at the top of the building's front. Village facilities include a Co-op convenience store and Post Office, village hall and community centre, a playing field, play area, veterinary centre, hairdressers and a guest house. There are fast food outlets: a fish and chip shop and a Chinese takeaway. Ulceby public houses are The Fox Inn, and the Yarborough Arms located 1 mile (1.6 km) from the centre of the village; a previous public house, The Brocklesby Ox, is now the site of the aforementioned convenience store. The village has a preschool and primary St Nicholas C of E Primary School. Ulceby railway station, at Ulceby Skitter, is situated 1 mile, and Ulceby Truck Stop (an HGV park with cafe and petrol station) 2 miles (3 km) from the centre of village. Religious sites and landmarks are the Anglican church of St Nicholas, Ulceby Seventh-day Adventist Chapel, and a war memorial; Ulceby Methodist Chapel closed in June 2011. ^ "Key Figures for 2001 Census: Key Statistics: Area: Ulceby CP (Parish)". Neighbourhood Statistics. Office for National Statistics. Retrieved 26 April 2013. ^ "Key Figures for 2011 Census: Key Statistics: Area: Ulceby CP (Parish)". Neighbourhood Statistics. Office for National Statistics. Retrieved 26 April 2013. ^ "St Nicholas Church of England Primary School". Retrieved 26 April 2013. ^ Hollowday, Vivian. "George Cross Database". George Cross Database. Archived from the original on 9 June 2011. Retrieved 31 July 2015. This page was last edited on 24 January 2019, at 16:46 (UTC).